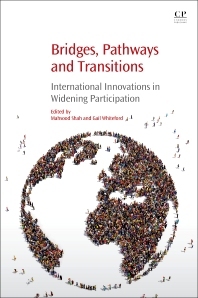 Bridges, Pathways and Transitions: International Innovations in Widening Participation shows that widening participation initiatives and policies have had a profound impact on improving access to higher education to historically marginalized groups of students from diverse socioeconomic and cultural backgrounds. The research presented provides a source of inspiration to students who are navigating disadvantage to succeed in higher education against the odds. There are stories of success in difficult circumstances, revealing the resilience and determination of individuals and collectives to fight for a place in higher education to improve chances for securing social mobility for next generations. The book also reveals that more work and policy interventions are needed to further equalize the playing field between social groups. Governments need to address the entrenched structural inequalities, particularly the effects of poverty, that prevent more academically able disadvantaged students from participating in higher education on the basis of the circumstances of their birth. Across the globe, social reproduction is far more likely than social mobility because of policies and practices that continue to protect the privilege of those in the middle and top of social structures. With the gap between rich and poor widening at a rate previously unseen, we need radical policies to equalize the playing field in fundamental ways. 2. What is Widening Participation and Why Does it Matter? Mahsood Shah is an Associate Professor and Deputy Dean (Learning and Teaching) with School of Business and Law at CQUniversity, Australia. In this role Mahsood is responsible for enhancing the academic quality and standard of programs. Mahsood is also responsible for learning and teaching strategy, governance, effective implementation of policies, and enhancement of academic programs across all campuses. In providing leadership for learning and teaching, Mahsood works with key academic leaders across all campuses to improve learning and teaching outcomes of courses delivered in various modes including face-to-face and online. At CQUniversity, he provides leadership in national and international accreditation of academic programs. Mahsood is also an active researcher. Gail Whiteford was Australia’s first Pro Vice Chancellor for Social Inclusion and in this role Chaired Bridges, a consortium of five universities in a collaboration to increase the representation of disadvantaged people in higher education. Gail is currently a professor of occupational therapy at Griffith University, Queensland, Australia and through her firm, Whiteford Consulting, undertakes evaluative research, strategic and staff development activities across education, health and development sectors.